The experimental signature for neutrinoless double beta decay is a monoenergetic peak at the Q-value (2528 keV for 130Te ). The only spread of the peak is introduced by detector resolution. The peak is expected to be very small based on limits set by previous experiments. To observe such a peak, we need high energy resolution (small spread), low background, and large statistics. In many ways, bolometer is an excellent choice for rare event experiments such as CUORE. Bolometric detection is a method of measuring the energy by turning the energy into a change in temperature of the bolometer. This tiny temperature rise is then read out through very sensitive Neutron Transmutation Doped (NTD) germanium thermistors. High Energy Resolution: Because of the T3 dependence of the heat capacity of the solids at low temperatures and the exponential dependence of the resistance of the thermistor on temperature, we can achieve an energy resolution of 5 keV at ~3 MeV. Low Background: Since the crystals can be grown with very low levels of impurities, the background can be reduced significantly. The background from post production activation and surface contamination can be limited by careful storage and handling. High Counting Efficiency and Good Scalability: Bolometers can often be employed as both the source of a radioactive decay and the detector. Several candidate isotopes are available for neutrinoless double beta decay searches, including 130Te, 76Ge, 136Xe, etc. An ideal decay candidate would feature a high Q-value, large nuclear matrix element, and large natural isotopic abundance. High Q-values larger than energies of natural gamma backgrounds (up to 2615 keV) reduces background. High Q-values and large nuclear matrix elements enhance the expected number of 0νββ decay events because the phase space factor scales as Q5 and |M|2. The large natural isotopic abundance of a candidate isotope eliminates the need of enrichment and thus greatly reduces the cost of an experiment. 130Te is a great choice from all three aspects and especially appealing because of its large natural isotopic abundance of 34%, which is far greater than that of the other decay candidates with comparable Q-values. CUORE will be able to achieve high sensitivity using natural, unenriched tellurium. CUORE is located within the mountain of Gran Sasso, about 100-km east of Rome in Italy. The Underground Laboratories is located in the mountain of Gran Sasso (meaning something like “Big Pebble “) which provides rock overburden of 1400 m, or 3600 m.w.e., shielding us from much of cosmic ray background, reducing the muon flux to only those with energy > 1.4 TeV which results in 1 muon per square meter per hour inside the laboratories. 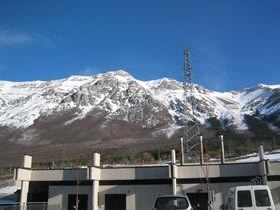 In addition, the Gran Sasso rock has a low rate of natural radioactivity, making this an ideal place to do experiments that require very low background radiation, such as our double-beta decay experiment.